The April jobs numbers are an important step toward restoring the Federal Reserve’s confidence that the economic expansion is on track after a first quarter slump. 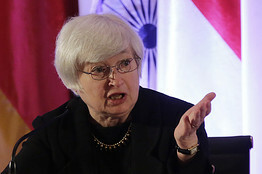 This keeps the Fed on a path toward raising short-term interest rates later this year. Fed officials will want further confirmation the economy is growing at the 2.3% to 2.7% pace they project and inflation heading back toward their target of 2%. Because they want that confirmation, a June rate increase looks unlikely and September the most probable liftoff date. “There is nothing in this report that would force the Fed to hike before September,” Krishna Guha, vice chairman of Evercore ISI, said to The Wall Street Journal of the report, a view that reflected the quick consensus among other economists surveyed by the WSJ after the numbers were released. Payroll growth bounced back after slowing sharply in March, with employers adding 223,000 jobs in April, which is in line with their average since September 2012, when the Fed launched its third bond-buying program. An index of aggregate hours worked by labor was up a healthy 2.5% from a year earlier, also in line with its average of the past few years. Those data suggest a moderate expansion of output and income continues after the first quarter slowdown. The jobless rate continued to fall, which suggests that slack in the labor market is diminishing, a development which many Fed officials believe will eventually lead to upward wage and inflation pressures. However, evidence of such pressure is mixed. Average hourly earnings of private workers were up 2.2% in April from a year earlier, within the 1.8% to 2.2% range they’ve been in since 2013. While there is no evidence of a wage breakout there, other measures of wages, including in the Labor Department’s Employment Cost Index, are starting to show signs of improvement.